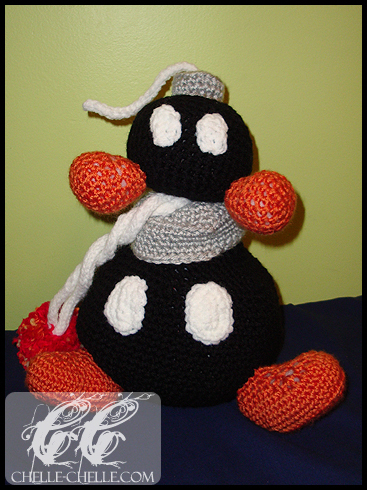 You might recognize this little guy, if you happen to be a fan of Mario and assorted Mario games. He’s crocheted with 100% acrylic yarn and 100% polyester stuffing. 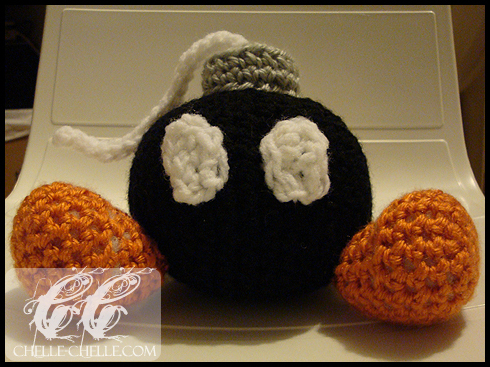 Yarn brands used were Red Heart (black and white), Red Heart Soft (orange) and Bernat Satin (silver-grey). The larger one was made by my sister and has two white strands coming out of it’s top because her’s is actually a bag (the fuse box comes off and the bag can be opened), it’s stuffed with plastic bags in the photos. Mine’s a stuffie and considerably smaller. 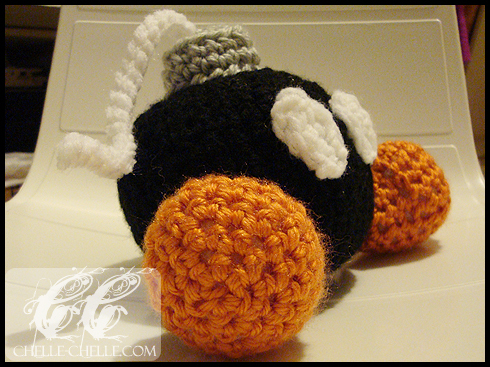 Also, mine is lacking a red pom-pom so it’s not about to blow up in your face. This is so cute =D! You did an awesome job! I’m sure the new owner is very pleased! …I want one. We have a bunch of plastic and vinyl Mario toys on the shelves above the couch. So cute.